ASX 200 up 2 to 6167. High 6172 Low 6134. Good volume. 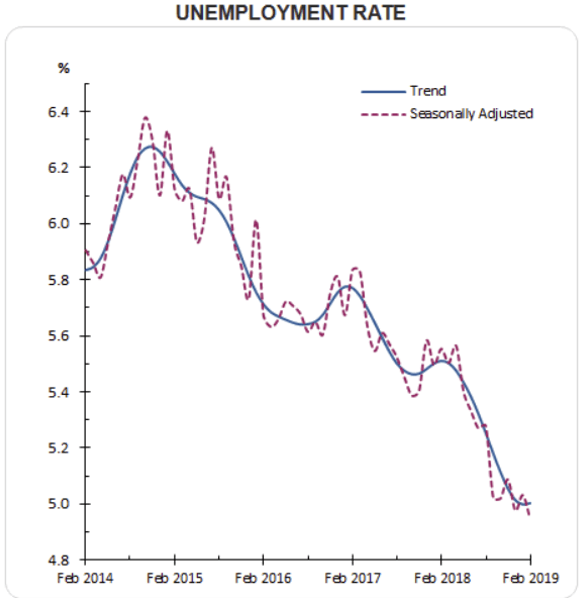 Sub 5% unemployment will please RBA, takes pressure off to cut. Banks remain mixed. Resources find feet as a bright spot. Energy shares too firm on crude prices. USD earners slip as jobs boost the dollar. US futures up 61. Quadruple witching tomorrow. NUF +6.15% the bounce is in. May not last. JIN +3.25% Jackpot to hit $70m next week. PGH -7.58% back in the dog house. Z1P -7.26% SPP announcement as placement weighs. SPT -13.94% no new clothes for this one. WGN -4.76% still struggling to cement its place. FLT -4.65% ex dividend and special. Speculative Stock of the Day: PEN +21.28% permit to mine amendment for low pH mining approved in US Lance project. Washington H. Soul Pattison & Co. (SOL) +0.73%First half results. Statutory NPAT up 22.6% to $179.2m, revenue up 31% to $723.3m. An interim dividend of 24c was declared. The result was underpinned by a solid performance from New hope corporation (NHC) and Brickworks (BKW). Management expects performance in thermal coal, telecommunications, and property to continue to their run higher despite softening general market conditions. The ACCC has announced it will not oppose the proposed merger between Xenith IP -1.91% (XIP) & QANTM (QIP) +1.06% The watchdog is also reviewing IPH’s proposal for XIP. Navitas (NVT) – Is in a trading halt waiting on an announcement related to the takeover offer from BGH private equity. Sigma (SIG) – 0.91. Revenue down 2.9% underlying to $3.98bn. EPS 4.8c down 21.3%. Confirms guidance of $55-60 million EBITDA for FY20. Whilst Sigma has not actively pursued the share buy-back program this year, this remains a live option looking forward. Debt at year end was $243.2m, this will quickly reduce with the release of working capital around September this year, with debt expected to return to around $100m by 31 January 2020. A final dividend of 2c. The AUD firmer following the February labour force numbers. Unemployment reached an 8-year low of 4.9%, down 0.1% from the January reading. The economy added 4,600 jobs, while the number of unemployed declined by 11,700. 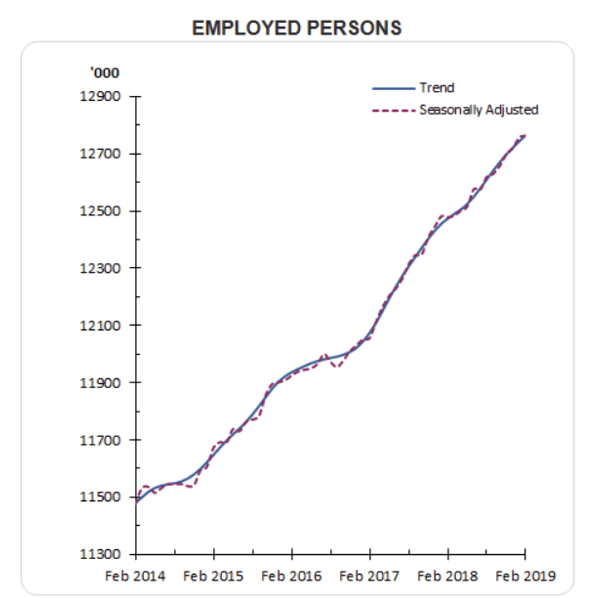 Employment was up 4,600 to 12,763,400 persons, missing estimates of 15,000. Full-time employment decreased 7,300 to 8,742,700 persons. Part-time employment increased 11,900 to 4,020,700 persons. Participation rate decreased 0.2 points to 65.6%, missing estimates of 65.7%. The future is coming. Yum China which flogs KFC in the Middle Kingdom is making a push into cashless stores which line up a camera to scan your face to process payment whilst a robot makes the food and you can turn into the music of your choice on your smart phone and AirPods. Next up will be an AI function to harness the eating desires to tailor make a menu for customers. This move has already boosted spending by 1% or US$480m annualised since January. Coming to a Domino’s in your suburb. Apple launches new AirPods. Longer talk time, wireless charging. Still look stupid. Levis Strauss will return to the market with a US$6.6bn valuation after strong demand. UK PM May gets her delay to Brexit but only until June. Still needs parliament to say Ja, Oui or Si. Pas de chance. Germans starting to panic on EU posturing on Brexit. German car industry has enough issues without this on top. UK house price growth has fallen to its lowest level since 2013. Annual growth dropped back to 1.7% from 2.2% in December. The average house price in the UK is now £228,147, down from a peak of £232,116 in August. London has been the problem with prices falling 1.6% in January. Brexit woes again. RETIRED HUSBANDAfter retiring, Peter’s wife insisted that he accompany her on her trips to Target. Unfortunately, like most men, Peter found shopping boring and preferred to get in and get out. Equally unfortunate, his wife is like most women – she loves to browse. (1.) January 15: He took 24 boxes of condoms and randomly put them in other people’s carts when they weren’t looking. (2.) February 2: He set all the alarm clocks in Homewares Dept to go off at 5-minute intervals. (3.) February 7: He made a trail of tomato juice on the floor leading to the women’s restroom. (4.) February 19: He walked up to an employee and told her in an official voice, ‘Code 3 in Homewares. Get onto it right away’.. This caused the employee to leave her assigned station and receive a reprimand from her Supervisor that in turn resulted with a Union grievance, causing management to lose time and costing the company money. We don’t have a Code 3. (5.) March 4: He went to the Service Desk and tried to put a bag of Twisties on layby. (6.) March 14: He moved a ‘CAUTION – WET FLOOR’ sign to a carpeted area. (7.) March 15: He set up a tent in the Camping Department and told the children shoppers he’d invite them in if they would bring pillows and blankets from the Bedding Department to which twenty children obliged. (8.) March 23: When a clerk asked if they could help him he began crying and screamed, ‘Why can’t you people just leave me alone?’ An ambulance was called. (9.) April 4: He looked right into the security camera and used it as a mirror, while he picked his nose. (10.) April 10: While handling a speargun in the Sporting Department, he asked the clerk where the antidepressants were. (11.) April 23: He darted around the store suspiciously while loudly humming the ‘ Mission Impossible’ theme. (12.) May 6: In the Auto Department, he practiced his ‘Madonna look’ using different sizes of funnels. Please accept this letter as the notice to implement a permanent ban of both of you, from this Store.